The purpose of these resources is to ensure that grant holder reporting meets DFID’s requirements and clearly demonstrates the impact achieved as a result of UK Aid Direct funding. We recommend that you bookmark this web page to easily access these resources online, or alternatively download the material to read offline. This guidance – in brief – is designed to help you navigate the financial reporting section of your project on SMILE. An Accountable Grant Arrangement is agreed for each project approved for funding from DFID. This is an example agreement for your reference. A Memorandum of Understanding (MoU) is a document which sets out the agreement between the organisation that holds the grant, as well as any partner organisation administering DFID funds as part of this grant. A draft MoU for your project should be sent to your Performance and Risk Manager for agreement within 30 days of your project start date and this document gives you some guidance to follow. This is a template UK Aid Direct grant holders can use and adapt for their draft MoU. This one-page document summarises UK Aid Direct’s Theory of Change. This document offers some advice on writing your project’s Theory of Change. Results frameworks and logframes are essential throughout the project cycle, informing decision-making at each stage. This guidance looks at identifying risks and options, designing projects, as well as monitoring and evaluation. This guidance is for Small Charities Challenge Fund grant holders only. This template is for Small Charities Challenge Fund grant holders only. This budget and workplan tracker template is for Small Charities Challenge Fund grant holders only. This document from DFID presents guidance on delivery chain mapping, as well as delivery chain risk mapping. This template will need to be filled out and submitted by grant holders as part of their quarterly reporting schedule. It will need to be uploaded through the SMILE system. Download for more information. What is the International Aid Transparency Initiative (IATI)? Learn more here from UK Aid Direct. DFID places great importance on transparency compliance, and because of this, project information must be published every quarter, in line with the IATI Standard. This document aims to provide you with all the information and contact details you will require to help you to do this. This is a recording of a webinar that took place in October 2016 featuring Fiona Waters, Effectiveness and Transparency Coordinator for Bond. This guidance from Bond covers the following: how to set up an account for your organisation, how to keep it updated, as well as how to add links to your XML data files. All grant holders of the UK Aid Direct Fund are expected to complete the OCA on a bi-annual basis. Read this detailed guidance to discover why it is important and how to do it. After completing your OCA, it will be necessary to input your scores into this spreadsheet (see the reference to this in the Guidance document above). Feedback from grant holders has told us that more opportunity to network within the UK Aid Direct community would aid the sharing of knowledge, resulting in the development of stronger, more effective grant holders who are able to deliver better outcomes. With this in mind we have established a private Facebook group. Read the guidance here and if you are happy, then follow the link to the consent form to receive an invitation to join the group via email. This presentation would be useful for all UK Aid Direct grant holders interested in checking branding and communications expectations. UK Aid Direct communications handbook for grant holders. Featuring rules on UK Aid branding, advice on sharing your news, templates and tips. A sample press release template grant holders might want to adapt for their purposes. This template has been designed with Small Charities Challenge Fund (SCCF) grant holders in mind, but other grant holders could also use it. Contacting your local MP with information on your grant award is a great idea and this template can be adapted to suit your needs. Here is a template which we hope you will find useful to structure your ideas for sharing your learning from your project with the UK Aid Direct team. To take and retain film footage or photographs it is important you have the beneficiary’s permission. Here is a template you could use if you don’t already have one for your organisation. We recommend you complete this form (or something similar), before sharing any photographs with the UK Aid Direct team. Please try to remember to submit it with your files. We recommend you complete this form (or something similar), before sharing any film footage with the UK Aid Direct team. Please try to remember to submit it with any footage you send. UK Aid Direct has a zero-tolerance approach to fraud and fraudulent behaviour that may lead to misuse of grant funds, and is committed to creating an environment in which you feel able to report fraud directly to your Fund Manager. MannionDaniels has engaged Expolink, a whistleblowing and fraud service provider to support you with this. It is an anonymous, free-to-call and confidential service. To report an incident concerning suspected misuse of funds, please click on this link (opens in a new window). Creditor Reporting System (CRS) Aid Activities database 2017, reporting on 2016 flows. This short presentation looks at the purpose of beneficiary feedback mechanisms, what they can be, and how we can use them. This webinar was held on 29 October, 2018 for Jo Cox Memorial Strengthening grant holders (pending due diligence). This is a copy of the welcome presentation slides given on 29 October, 2018 to Jo Cox Memorial Strengthening grant holders (pending due diligence). This is a recording of the presentation given to Small Charities Challenge Fund grant holders on communications and branding on Monday 4 March 2019. It featured: preparing for the official announcement of your grant, the timing of the announcement, branding, and useful links. This is a recording of the webinar presented to grant holders of the first Small Charities Challenge Fund (SCCF) round. It was designed to provide more detailed information around narrative reporting of projects. Presented on 11 September, 2018. This presentation accompanied the webinar given to grant holders of the first Small Charities Challenge Fund (SCCF) round. It was designed to provide more detailed information around narrative reporting of projects. 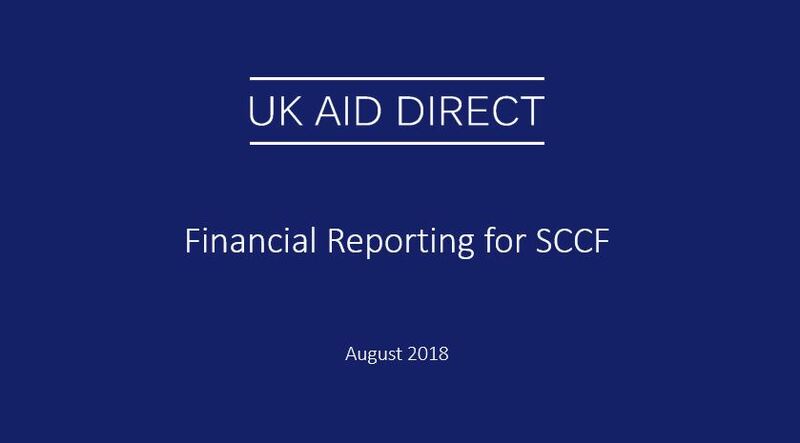 This is a recording of the webinar which took place on 2 August 2018 to Small Charities Challenge Fund grant holders on financial reporting requirements. 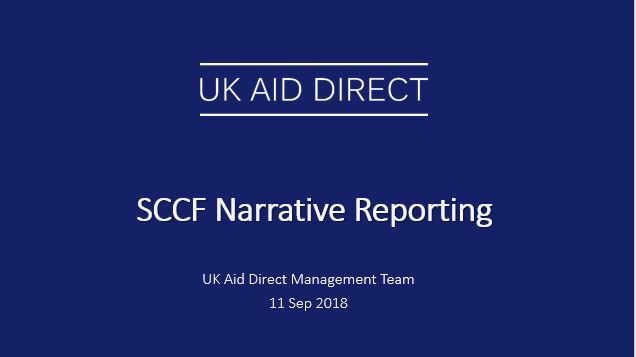 This is a copy of the presentation given to SCCF grant holders on Thursday 2 August 2018. The recording can be clicked on above. View the slides to a webinar from the UK Aid Direct technical team on OCA, partnerships, VfM and beneficiary feedback mechanisms here. Presented on 15 March, 2018. To receive an audio recording of the webinar, please contact your PRM. Read the transcript of the OCA, partnerships, VfM and beneficiary feedback webinar, presented on 15 March 2018. Listen to a webinar led by UK Aid Direct’s Deputy Fund Director, Karen Stephenson on VfM. Recorded on 9 October, 2017. Download a copy of the presentation on value-for -money from webinar held on 9 October, 2017. Grant holders were introduced to a new risk reporting template and reporting schedule in 2018 to strengthen the risk-based approach to programme management across the UK Aid Direct portfolio. This podcast speaks to four grant holders about their experiences with the new reporting requirements and the practicalities of managing and mitigating risk within the contexts of their diverse projects.